Ask many librarians what group of patrons is the most difficult to connect with and you might get a variety of answers. Obviously it varies based on location, public transit (or lack thereof), range of services offered etc. In my system a common response is high schoolers. They have packed schedules with little free time to read or visit the library, often their reading is proscribed by coursework, or superseded by after school activities, hanging out with their friends or college applications. Our Teen New Book shelf is jam packed of the latest and greatest titles with very little movement. When public library staff visit local high school, both institutions benefit. I am fortunate enough to work in a town, Grandville, Michigan, where the public library is highly valued and a community hub. My colleague Kris Vogelar, created a wonderful partnership many years ago called A+ Partners in Education. This group pairs local schools with our Youth Staff at the beginning and end of the school year to discuss education initiatives, library programming, and how we can support each other in our goals. It was through this A+ group that our connections with the Grandville High School began. Eric Tower, English teacher and the English department head at Grandville High School, approached me first in fall 2017. He had heard that we offer mobile checkout during outreach events and wondered if we might be able to provide that at the high school to meet students where they are. I began visiting during study hall period about once a month to provide new books, recommendations and new library cards. While it took a bit, I found that I developed a small following of students who would visit me every time. When I go during Seminar Period now I’ll frequently check out 15-20 books, make 2-3 new cards and visit with 30 students. 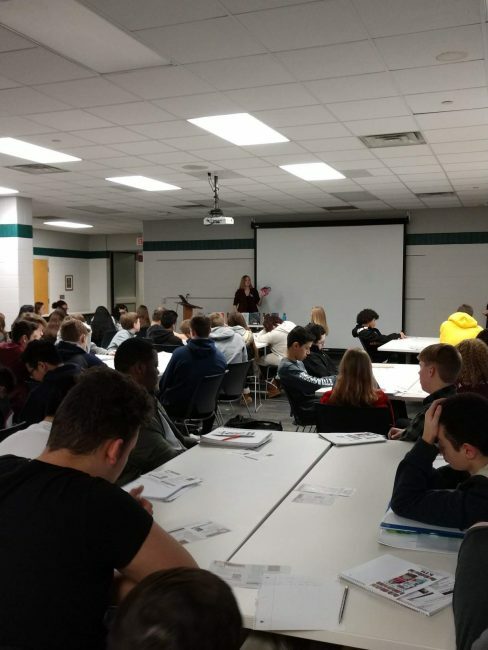 A+ Partners in Education program paved the way for a successful partnership between Kent District Library and Grandville High School, Michigan. The next step in our partnership’s development was sparked by a request from Jen Ward, a new teacher in the English Department. 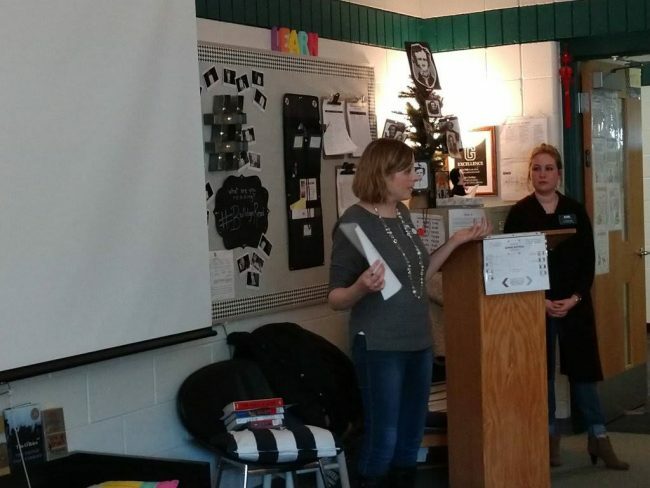 Jen invited Grandville library staff to visit her Independent Novel Class. This resulted in the incredible opportunity to visit Jen’s fall and spring classes during the 2017-2018 school year, sharing various library programs and resources, as well as booktalking some new YA books. We were able to give her students new book ideas while also promoting our library programs, a total win-win! booktalks as a demonstration of what we could offer. Between that meeting and Jen’s kind support, we have ended up providing a combined total of 6 visits to over 430 students this year. 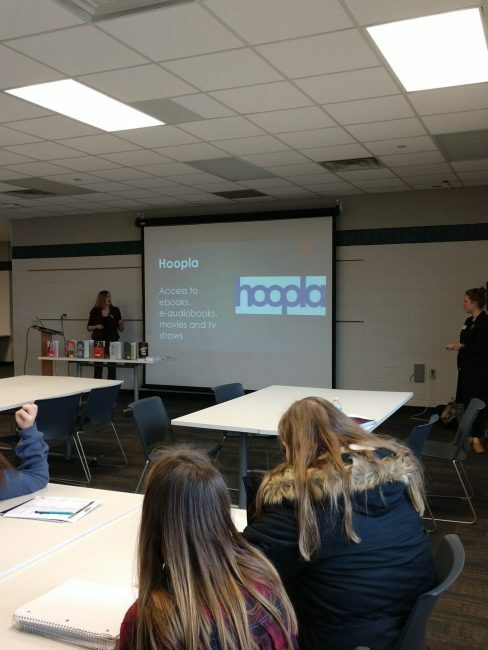 Kent District Library brings booktalks, demos and mobile checkout to students of Grandville High School. Building this partnership required a number of things. First, we needed school staff members to buy in and see the value our visits could provide. Having a few key people in your corner can work wonders. Second, we needed to be patient. It took time to build a relationship with teachers and generate strong interest in the mobile checkout visits. Third, it’s important to be flexible. School schedules are constantly shifting and evolving so our visits evolve with teacher’s needs. We’ve added discussion of banned/challenged books, shifted our booktalks to feature only American authors, brought books that meet certain students’ interests etc. It has been truly incredible to watch this partnership grow during these past two years and I look forward to seeing how it continues to grow in the future. Katie Lawrence is a youth librarian at the Grandville Branch of Kent District Library in Michigan. This post addresses the ALSC Core Competencies of I. Commitment to Client Group, II. Reference and User Services, III. Programming Skills and V. Outreach and Advocacy.